If you Google “Roughest Stretch of Water in the World”, 90% of the results will mention the Drake Passage. The Drake Passage is a 600 mile wide waterway that connects the Pacific and Atlantic oceans between the South Shetland Islands and Cape Horn, and considered one of the worlds roughest waters. The Drake Passage was known for its stormy seas and icy conditions, which made getting through Cape Horn a real test for the ships and crews that were pushing through it. Cyclones that form in the Pacific Ocean cut from west to east across the southernmost part of the passage and add to the rough waters. Another test for this passage is the low temperature winds that range from 41 ˚F in the north and 27 ˚F in the south. The location of the Drake Passage contributes greatly to its treacherously rough waters and its reputation. The Drake is located on a narrow gap that is between landmasses, in an area with naturally high wind speeds, and a massive global current. 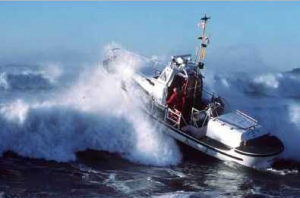 These factors make the passage one of the roughest waters in many regions, even ones that have extremely rough seas. The current running through the Drake forms part of the Antarctic Circumpolar Current, which is the most voluminous current in the world and pushes between 3,400 and 5,300 million cubic feet through per second. Historical accounts of early Antarctic exploration have brought an increase in Antarctic tourism, which the majority of crosses the Drake. With tourists crossing regularly, the Drakes reputation for rough waters has become better known. Many early explorations mention the rough condition of the Drake and the waters around it. This is also a good area for whale, dolphin, and seabird watching. Blue and fin whales, crabeater seals, petrels, albatross and penguins are all common sightings during tours on the Drake Passage. There are many other seas around the world that are as rough, or even some that are rougher, than the Drake Passage. One example of another of the worlds roughest waters is the North Atlantic shores near Gloucester, MA. This area is frequented by hurricanes, and has been quoted as “the roughest stretch of water in the world”. The movie ‘The Perfect Storm’ was even written about a storm in this area. The Southern Ocean is known for having huge swells and rough seas, with the rough water being comparable to the Drake Passage. Most of the Antarctic cruise ships avoid these waters and push through the Antarctic Peninsula from South America, which means that the danger of the South Ocean is less well known. Click here to get your free quote!